All endodontic instruments create dentinal debris and smear layer as a consequence of their action on root canal walls. Hand instrumentation has remained a standard for more than five decades and continues to be a standard method of pulp space instrumentation. However, more recently several investigators have demonstrated that rotary systems using Ni-Ti instruments led to good results in the instrumentation of pulp spaces. Ni-Ti instruments represent a relatively new approach to the rapid preparation of canals with standardized taper. The amount, the thickness and type of smear layer produced by newer Ni-Ti instruments must be assessed. Recently, new rotary Ni-Ti instruments with different configuration and design have been marketed as Twisted rotary instruments SybronEndo (Orange, CA), and HERO shapers (Micro-Mega, Besenηon France). EDTA in combination with NaOCl is an excellent combination of irrigant to remove all tissue, necrotic debris, infected pre dentin and dentin, smear layer as well as softened dentin to a great extent, for efficient final cleaning and shaping of the pulp space. The purpose of this study was to evaluate under SEM, the type of smear layer produced by the newer Twisted rotary instruments in comparison to the time tested endodontic hand instruments. A comparative in vitro study to evaluate the smear layer in the root canal following the use of ProTaper hand instruments, Twisted rotary instruments and HERO shapers instruments was undertaken in the Department of Conservative Dentistry and Endodontics, Dr. D.Y. Patil Institute Of Dental College And Hospital, Pimpri, Pune. Fifteen freshly extracted, intact, non-carious and unrestored single rooted and single canaled human mandibular premolars collected, stored, disinfected and handled as per the recommendations and guidelines laid down by OSHA and CDC. All the collected teeth were cleared of blood, calculus and surface deposits and stored in isotonic saline. The selected specimens were utilized for study within one month of extraction and storage. Teeth were randomly distributed among the groups. The extracted teeth stored in normal saline were retrieved. Conventional endodontic access cavities were prepared in a high speed handpiece. To determine the working length a size 10 K-file was inserted until it reached the apical foramen and 0.5 mm was subtracted from its length. A small amount of wax was placed on the tip of each root to prevent irrigating solutions from passing through the apical foramen. Crowns of all teeth were cut off at the cemento-enamel junction with a carborundum disc. The roots were then randomly divided into 3 groups of five samples each. A sequential CROWN DOWN TECHNIQUE was carried out in all the three groups. Specimens in this group were instrumented with ProTaper Ni-Ti hand instruments. CROWN DOWN SEQUENCE- S-1, S-2, F-1, F2 and F-3 was followed. Specimens were instrumented with HERO shaper rotary instruments in a high torque, low speed hand piece with speed range between 300-600 rpm. Coronal to apical instrumentation technique- .06T size 20, .04T size 25, and .02T size 25 was followed according to the instructions. The specimens in this group were instrumented with Twisted series of rotary instruments in low speed hand piece with speed range between 300-350 rpm. Coronal to apical instrumentation technique- size 25, 0.06 taper was followed according to the manufacturer's instructions. Irrigation was carried out with 10 ml of 3% NaOCl and 9.6 gms of 15% EDTA was used as chelating agent in all the 3 groups. To facilitate fracture into 2 halves for SEM examination, all roots were grooved longitudinally on the external surfaces with a carborundum disk avoiding penetration of root canals. Teeth were carefully split with hammer and chisel and stored in small labeled bottles containing normal saline until SEM evaluation. The specimens were then dehydrated, mounted on brass stubs. The stubs were marked with marking pen and gold sputtered for three minutes for a thickness of 100A° of gold in an ion sputtering machine. The specimens were examined under SEM (JEOL, Japan model 5309) for assessment of microscopic pattern of magnification X1000 for smear layer. 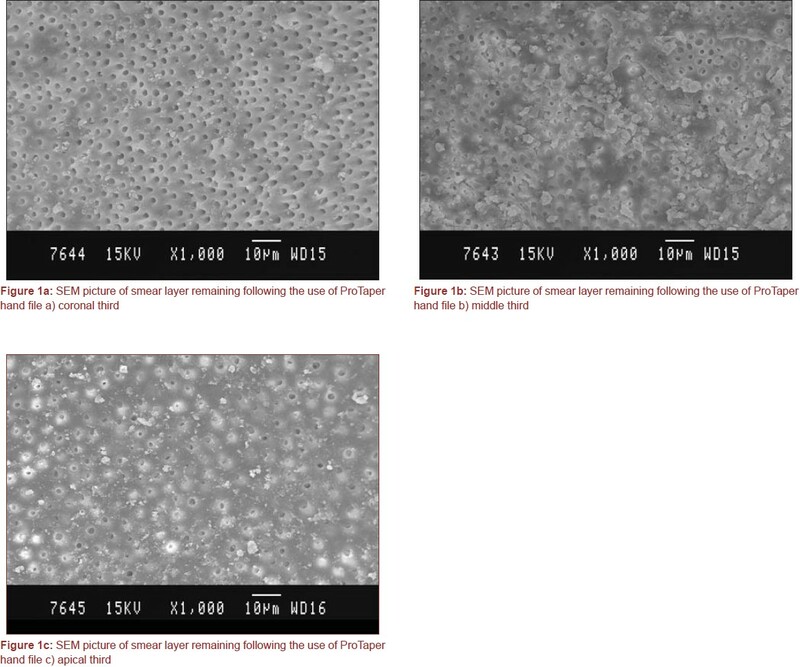 A standardized series of 3 photomicrographs were taken for each pulp space (one in the apical third, one in the middle third and one in the coronal third) for comparative purposes. Score 1 - No smear layer, dentinal tubules open. Score 2 - Small amounts of smear layer, some dentinal tubules open. Score 3 - Homogenous smear layer covering the root canal wall, only few dentinal tubules open. Score 4 - Complete root canal wall covered by homogenous smear layer, no open dentinal tubules. Score 5 - Heavy, non homogenous smear layer covering complete root canal wall. Data recorded was statistically analyzed using Mann Whitney 'U' test and Kruskal Wallis test. Results were statistically analyzed using Kruskal Wallis test [Table 1] and Mann-Whitney 'U' test [Table 2], [Table 3], [Table 4]. Results of the study showed that ProTaper hand instruments produced the least amount of smear layer and debris, followed by Twisted rotary instruments as shown in [Figure 1] and [Figure 2]. 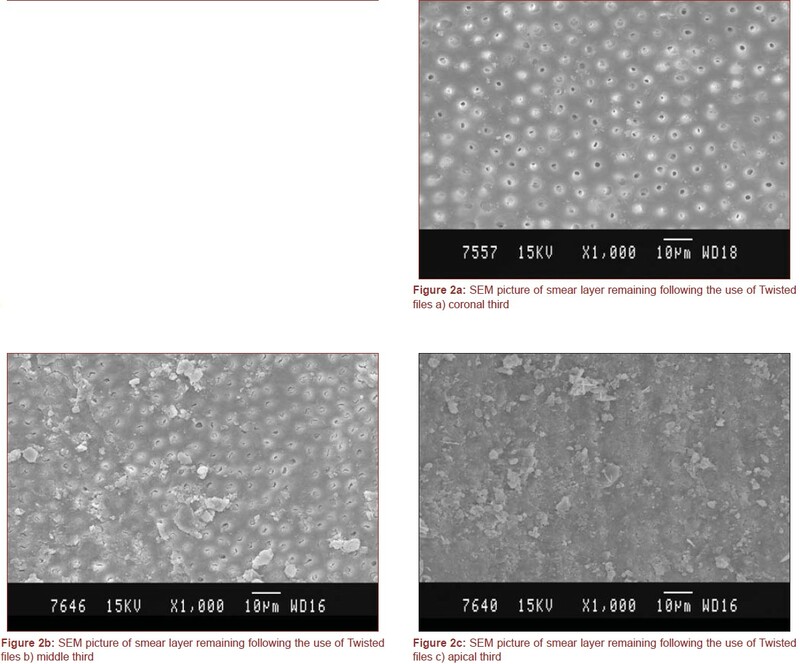 HERO shaper rotary instruments generated the maximum amount of smear layer as shown in [Figure 3]. The ability to clean effectively the endodontic space is dependent on instrumentation and irrigation which is the most important step in root canal treatment. Endodontic instruments may, in themselves create smear layer which plays a key role in successful debridement and disinfection. Ni-Ti instruments have been developed in an attempt to overcome the limitations imposed by stainless steel alloys. Ni-Ti instruments are 2 or 3 times more flexible than stainless steel files, exceed standard specifications for stiffness, angular deflection, and maximum torque to failure and their fracture resistance is unaffected by prolonged exposure to sodium hypochlorite. Several studies have confirmed the ability of rotary Ni-Ti instruments to maintain original root canal curvature even in severely curved canals. ,, In the present study, efficacy of hand ProTaper instruments, HERO shaper and Twisted rotary instruments have been evaluated for the removal of smear layer using SEM for evaluation. In the present study, Twisted rotary instruments clearly showed superior results in the cervical, middle and apical third compared to HERO shaper rotary instruments and the results are similar to ProTaper hand instruments in the middle third [Table 2], [Table 3], [Table 4]. Only a thin smear layer could be detected with many open dentinal tubules in most of the specimens in group III, which confirms the superior cleaning ability of Twisted compared to HERO shaper rotary instruments. , This could be due to instrument designed to collect debris and smear layer material produced during the preparation and carrying it out of the canal system. This is achieved by continuous rotation and the particular instrument profile. Twisted file instruments are non-landed with positive rake angles. It is made by twisting a file blank in combination with an R phase heat treatment and a deoxidation surface treatment, which increases the surface hardness and sharpness of the cutting flutes. It is triangular in cross section and has got superior flexibility due to the smallest cross sectional area resulting in best fatigue resistance. Despite these features, the scores in the apical third of the canal prepared using Twisted rotary instruments were more than the coronal third. The result of the present study also clearly states that the minimum smear layer were produced by the ProTaper hand instruments, since the technique and type of irrigating solution was kept standard for all 3 instrumentation techniques. The results were clearly superior to rotary instruments in the coronal, middle and apical third. ProTaper hand instruments have a wide range of tapers and designs. The instrument has a balanced pitch and helical angle that optimizes the cutting action and aids in debris removal. Secondly, the instrument tip has a partially active tip that is designed to aid smooth advancement of instrument apically. Ability to debride the tissue in the apical portion of the canal by creating space for the movement of the irrigants and chelating agents is possible particularly by S1 and S2 instruments coronally and F1, F2 and F3 apically. The amount of smear layer produced by ProTaper has been less compared to rotary which can be due to increased centrifugal forces resulting from movement and proximity of instrument to the dentinal wall forming a thicker and more resistant smear layer. Hence, the production of smear layer in rotary preparation is greater in volume than that produced by hand filing. It has been shown that cleaning can be significantly improved once the shaping procedure has been completed. In the present study, Crown down technique in cleaning and shaping has been advocated. The results of the apical third in the present study as with those of the other studies showed how difficult it is to remove smear layer from the apical third. It was reported that, the reduced dimension of root canal at the apical third frequently caused entrapment of air bubbles and prevented total wetting with the irrigant. On the other hand, using EDTA for 30 seconds, reported good cleaning of the apical third, although, they did notice some smear plugs in some of the specimens. However, in the present study, the method of shaping and instrumentation was analyzed with the type of irrigant used, time of irrigation and technique as a constant. In the present study, hand instruments showed minimal amount of debris production. In the rotary, Twisted series showed better results than rotary HERO shaper series. All type of instrumentation showed some amount of smear layer with inefficiency of cleaning at the apical third. However, the irrigating solution (antibacterial solution) and chelating agent used in this study was limited. Additional irrigation with antibacterial solution has been recommended by several authors to remove debris, as well as smear layer. However, none of the instrumentation technique so far has shown a smear free surface in the apical third of the canal. Further in vitro and in vivo investigation is required to evaluate the efficacy of these instruments in the removal of smear layer. Neither hand nor rotary preparation technique achieved total root canal debridement, both hand and rotary instruments produced smear layers. ProTaper hand instruments produced least amount of smear layer. When comparing ProTaper hand, HERO shaper rotary instruments and Twisted rotary instruments, HERO shaper series of rotary instruments showed maximum amount of smear layer followed by the Twisted series of rotary instruments. 1. Brännström M. Dentin and pulp in restorative dentistry. Journal of Endodontics March 1982;8:98. 2. Ahlquist M, Henningsson O, Hultenby K, Ohlin J. The effectiveness of manual and rotary technique in the cleaning of root canals; a scanning electron microscopy study. Int Endod J 2001;34:533-7. 3. Babay N. Nondiseased dentinal root surface following citric acid or tetracycline hydrochloride conditioning: A scanning electron microscopic study on the effects of ultrasonioc irrigation before and after root conditioning. Quintessence Int 1997;28:93-7. 4. 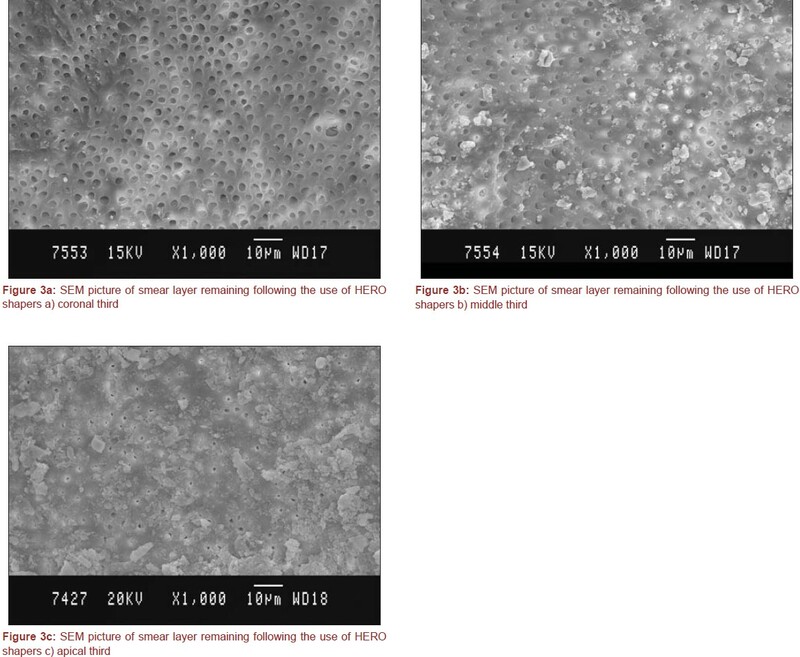 Lim TS, Wee TY, Choi MY, Koh WC, Sae-Lim V. Light and scanning electron microscopic evaluation of glyde file prep in smear layer removal. Int Endod J 2003;36:336-43. 5. Abbott PV, Heijkoop PS, Cardaci SC, Hume WR, Heithersay GS. An SEM study of the effects of different irrigation sequences and ultrasonics. Int Endod J 1991;24:308-16. 6. Baumgartner JC, Mader CL. A SEM evaluation of four root canal irrigation regimens. J Endod 1987;13:147-57. 7. American Association of Endodontists. Glossary. Contemporary Terminology for Endodontics, 1994. 8. Frick K, Walia H, Deguzman J, Austin BP. Qualitative comparison of two Ni-Ti rotary instruments. J Endod 1997;23:273. 9. Kosa DA, Marshall JG, Baumgartner JC. Analysis of canal centering with various mechanical instrumentation technique. J Endod 1998;24:27. 10. Oh SR, Chang SW, Lee Y, Gu Y, Son WJ, Lee W, et al. A comparison of nickel-titanium rotary instruments manufactured using different methods and cross-sectional areas: Ability to resist cyclic fatigue. Oral Surg Oral Med Oral Pathol Oral Radiol Endontol 2010;109:622-8. 11. Rotary Nickel Titanium Instrumentation Revolutionized: The Twisted File. In: Mounce RE, editor. Rotary nickel-titanium instrumentation revolutionized: the twisted file. Oral Health. 2008;5:6-9. 12. De Luca M, Gambarini G, Pongione G, Bossù M. Smear Layer Removal Using Profile .04 and .06 Tapers Rotary Instrumentation: a SEM Study. Journal of Evolutionary Dentistry Vol. 1 Nr.2, December 1998, pg. 59-67. 13. Barkhordar RA, Watanbe LG, Marshall GW, Hussain MZ. Removal of intracanal smear by doxycycline in vitro study. Oral Surg Oral Med Oral Pathol 1997;18:605-12. 14. Lopes HP, Elias CN, Estrela C, Toniasso S. Mechanical stirring of smear removal: Influence of the chelating agent (EDTA). Braz Endod J 1996;1:52-5.